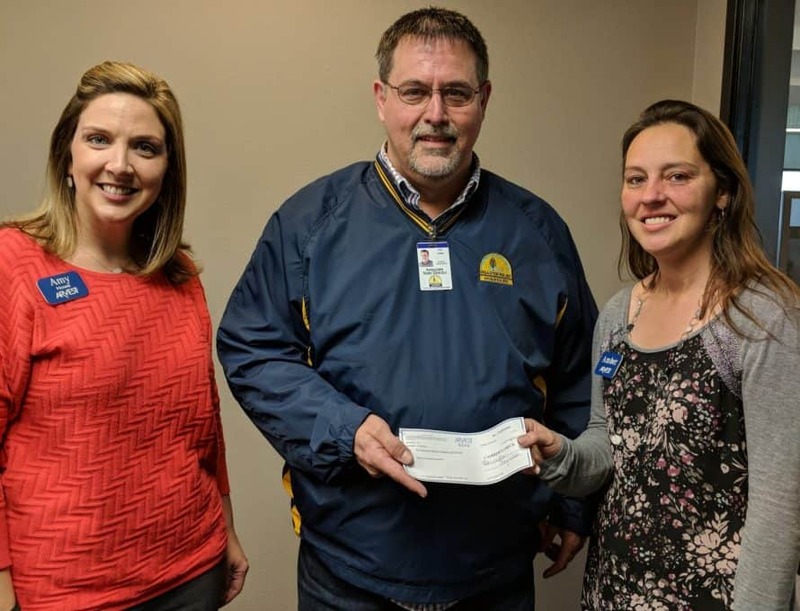 NEOSHO – Ron Crow, pastor of First Baptist Church, Diamond, and an associate state DR director, recieves a donation made to DR by Arvest Bank, Joplin, from Amber Pendley, a Neosho resident whose family was helped by DR after a flood damaged their home last April. Submitted photos. NEOSHO – Last April, Amber Pendley and her family walked into their home after a dance recital to find a disaster: Twenty-nine inches of flood water had rumbled through their house while they were gone. The water tore up carpet and flooring, tossed their deep freeze, refrigerator and washing machine on end, ripped doors off the jams, and left lawn timbers and an inch of water throughout the house. At the time, she couldn’t imagine how her family would cope amid this disaster. It would surely take several weeks to clean the mess, tear out drenched drywall, rip up soggy carpet, kill mold – so that they could finally begin rebuilding their home. And, in the meantime, Pendley, her husband Rodney, and her daughters Hailey and Kyndall would need to lodge with her parents. But three days later, a team of Missouri Baptist Disaster Relief (DR) members came to the rescue. And as a result of the blessing she received from this DR team, Pendley nominated Missouri DR and the Spring River Baptist Association for a donation from her employer, Arvest Bank in Joplin. Each week, the bank gathers money from employees for a “Friday jeans day collection” and then donates the money to local charities. Last month, Ron Crow, pastor of First Baptist Church, Diamond, and an associate state DR director, accepted a $216 donation from the bank on behalf of DR. While at the bank, he also met Pendley and heard her story. “They helped us move forward, they provided us relief, they provided us hope,” she said. Only a day after the flood, members of DR called Pendley to see how they could help her family, she recalled. “And, literally three days after our home was full of water and we felt that we would never have a safe, clean home again, we were given a huge relief. “I had no idea where the volunteers came from. All I knew was that they made me feel that my home was going to be okay, safe, sanitary and rebuilt. I never imagined that three days after the flood I would have so much hope. “I will never be able to thank them enough,” Pendley said. She added that she prays daily that God would bless the DR workers who brought help and hope to her family, and she prays that God will use them to bless many other families in the future. To learn more about Missouri DR – a ministry supported by the Cooperative Program and the Missouri Missions Offering, as well as individual donations that directly bless those facing disaster across the nation and around the world – visit www.mobaptist.org/dr.